Waterproof? Yes. Windproof? Yes. Breathable? Yes. An incredible value? Absolutely. Not to mention they're also the perfect complement to our Afterguard Jacket. We designed these no-frills bibs to be an outstanding value, but we also gave them the same wet weather-taming outer shell as the last generation of our best-selling foul weather gear. Our lightweight Afterguard Bibs feature two-layer construction: a nylon shell layer with a Durable Water Repellent (DWR) coating to make water just bead up and run off is bonded to a waterproof, breathable laminate layer with a thin nylon backing. 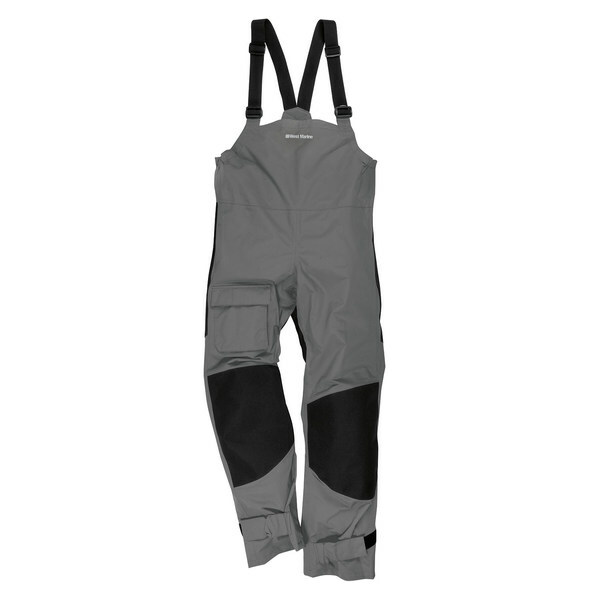 There isn't a lining so you can easily slip your Afterguard Bibs on over mid-layer clothing without binding. All the seams are taped to seal out moisture and wind from trying to squeeze through their tiny openings. Hook-and-loop ankle adjusters help stop water from entering through the bottom of your bibs. You'll find the wide elastic shoulder straps with double slider adjustment make your bibs more comfortable, plus they stretch and give as you move around for better coverage. The thigh cargo pocket fastens securely with a hook-and-loop closure so tools, a pair of gloves or other essentials will be close at hand. 600 denier polyester reinforcement patches are located at the seat and knees for extra durability and protection while sitting and kneeling. There's even an external hanger loop so you can hang them up to dry after washing or just getting them wet from boating or working in the rain. 100% nylon Taslan shell with polyurethane coating. Imported.